Marcos Rojo is an Argentine professional footballer who plays as a defender for Manchester United and for the Argentine National Football Team. Marcos Rojo made his first debut for Argentina in 2011 and has earned over 50 caps all over. 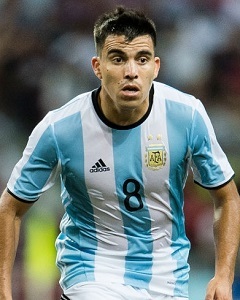 He reached the FIFA World Cup 2014 Final, and was the only Argentine included in the Castrol Performance Index Team of the event. Marcos Rojo intends to feel like what it is to win a World Cup rather than the torment he came across for Argentina when they lost to Germany 1-0 after extension in 2014, he said. The 28-year-old Manchester United defender told Inside United anticipating that Argentina would perform better than they did in skulking through in qualifying. The two-time World Cup winners play their final pre-World Cup match against Israel this Saturday with their crusade commencing against Euro 2016 quarter-finalists Iceland on Saturday 16 June. Marcos Rojo endorsed a new agreement with United in March this year which will keep him at the club till 2021 which will be against Nigeria in the group stage, a side he scored his first international goal against in the 2014 finals.